Reprinted courtesy of New York Times®. PLAYING THE ANGLES Lucie Thompson, an agent at the Corcoran Group in Palm Beach, Fla., photographed a house on Jupiter Island, left. 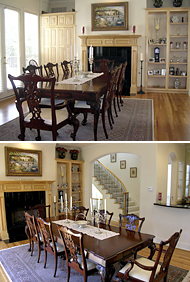 The company later hired a professional photographer, Robert Brantley, to shoot the same house. The results, right, speak for themselves. IN real estate, a picture can be worth more than a thousand words. Much, much more. When selling properties online, agents and Web designers say that the pictures buyers see of houses and apartments for sale are often the first - and sometimes the only - chance for a seller to make a good impression. Less-than-flattering pictures can turn buyers off and lead to lonely open houses. MORE DEPTH AND CONTEXT Meredith Maxfield, a sales associate with the Briggs-Freeman Real Estate Brokerage in Dallas, took the top picture of this dining room. Then she brought in Lauren Brown, a professional photographer, who stepped back to show the archway and staircase in the adjoining hall. Real estate agents who represent large and expensive homes say that virtual tours, which to provide a 360-degree view of a room, are another crucial tool for attracting buyers. “They’re a really great way of seeing a property without actually being there,” said Meredith Maxfield, a sales associate with the Briggs-Freeman Real Estate Brokerage in Dallas.